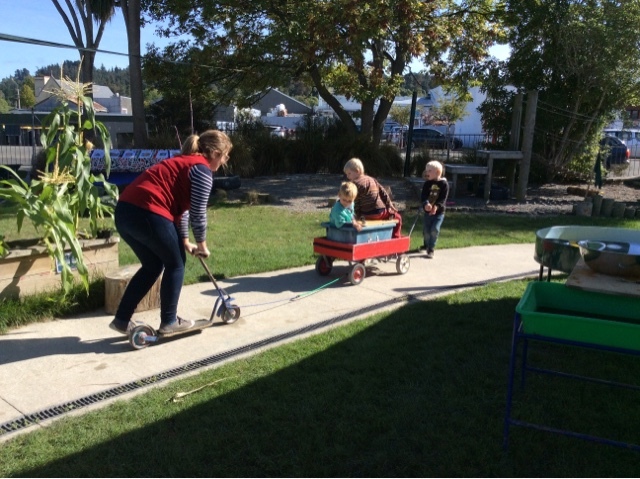 Today the tamariki were showing some interesting resourcefulness and expertise with the bungees, trolleys and a scooter. 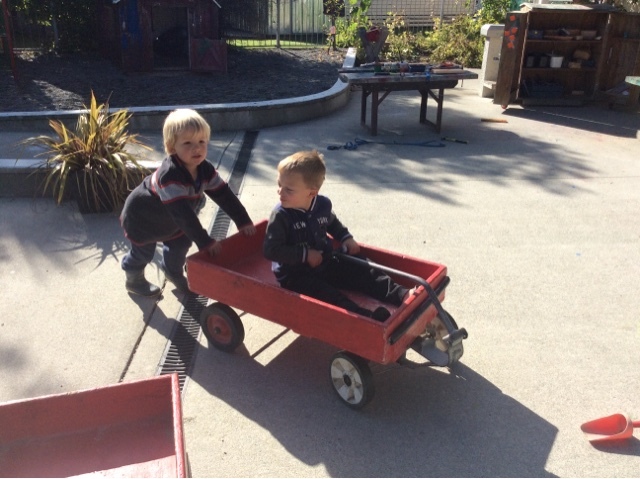 Leo and Elliot were very creative with their use of a crate and a scooter board. Leo tucked himself under the scooter board with Elliot sitting on top. This is very creative. He tino auaha tēnei. Then lots of persistence was shown as a bungy was attached to a scooter. Zac tried to stand the scooter up and run back to the trolley but the scooter didn't seem to stand up on it's own! It ended up being dragged behind. Ashleigh thought she would help out, wondering if it would work if she stood on it and let Zac tow her. It worked! Alice decided she wanted a turn at being towed too. Zac's evolving ideas or working theories allowed others to be actively involved as well. 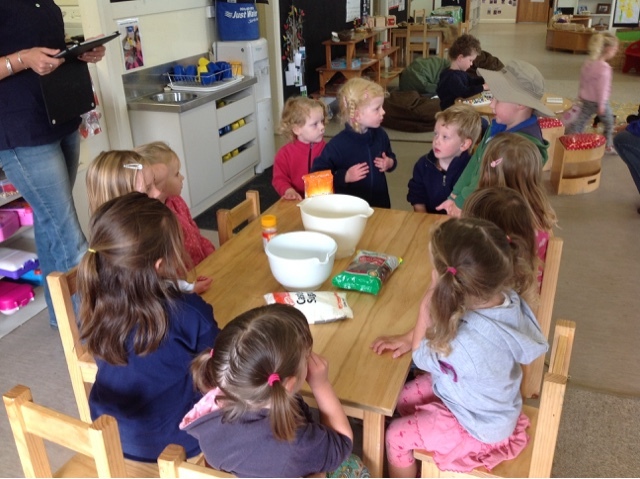 Ensuring lots of open ended resources are available allow the tamariki to be motivated and try out their ideas. It is nearly Easter time and every morning we can smell the sweet smell of hot cross buns baking at the supermarket. So today we decided to bake our own buns to eat and share together. 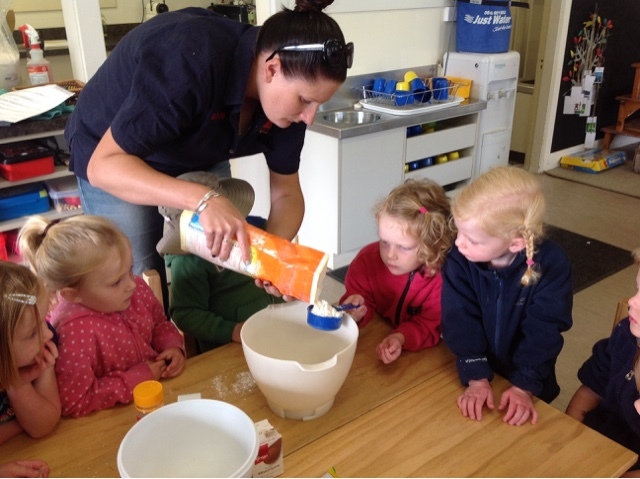 We gathered together and Heather shared her knowledge around what we needed to do to create our own hot cross buns. We mixed and measured all of the different ingredients striving for accuracy to ensure our measurements were correct for the recipe. Sometimes it was hard to wait for a turn be we managed our impulsivity and worked together all giving it a go. 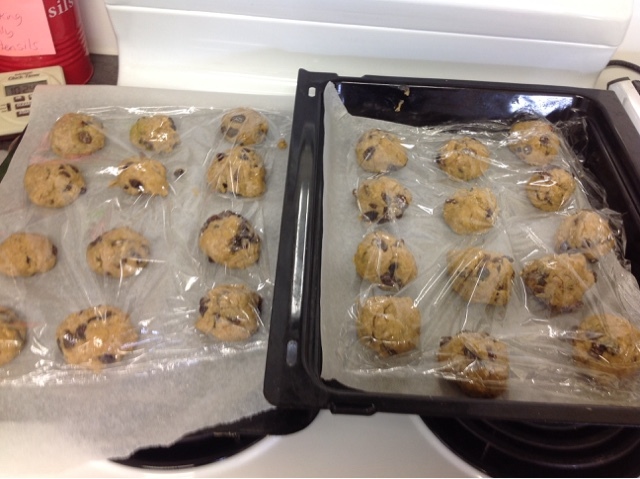 There was lots of different ingredients to put in and then we rolled the dough up into balls just like we would with the play dough and left them in a warm place to rise. 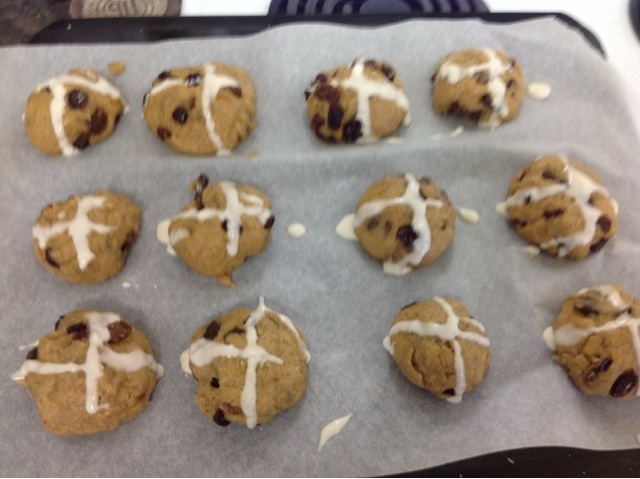 After a while they were ready for the next step, we added the crosses and put them in the oven to bake. Wow the smell was delicious just like the smell from the supermarket but this time we had created the smell and we were going to taste them too. Gosh the hot cross buns took quite a long time to prepare and there was lots of different steps for us to go through, but by working together and collaborating our ideas and skills we made and shared a very special Easter treat! Over the last week the investiagtors group (our oldest 10 children) have been creating a 'Wall of Wonder' around our current focus of zebras. We discussed what we already knew about zebras, then put on our thinking faces and did some deep thinking about what we would like to know by posing questions and putting them up on our 'Wall of Wonder'. Then it was research time as we explored finding the answers to our questions. We really extended our ideas and knowledge around zebras and learnt some interesting facts. Of great interest was why do zebras have stripes? Well we discovered that zebras use stripes to camouflage themselves from danger and that under their stripes they have black skin. Another of the questions posed was why do zebras have tails? For this question we did some digging into our own knowledge of the natural world. We thought about why other animals that we knew more about have tails like horses and cows and remembered that they used their tails for flicking away flies and bugs. So by applying our previous knowledge and making connections to zebras we were able to understand that a zebras tail did the same thing so that was why they needed a tail. It was great to research answers to our questions through books and the Internet but it was also amazing to be able to explore our own knowledge and apply it to a new learning situation. 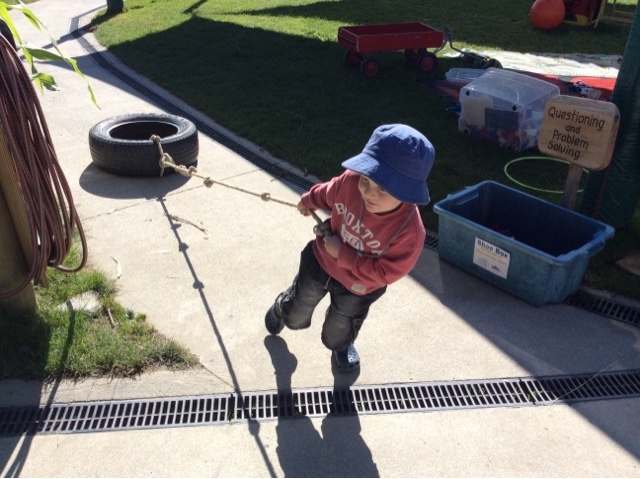 Today we have been testing out how strong we are. Using our gross motor skills in different ways. 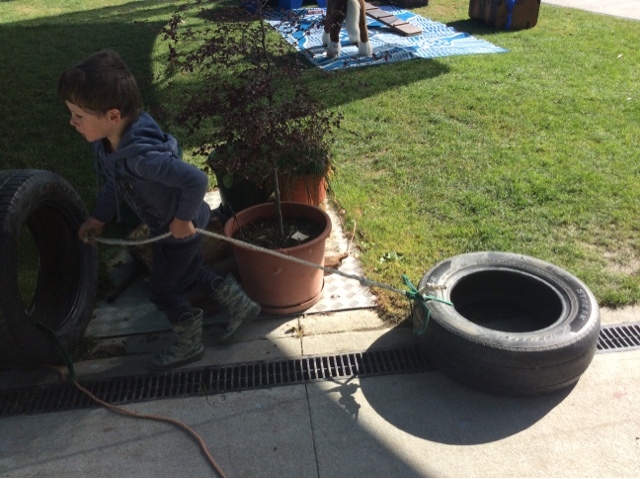 As we played we tied the ropes onto our tires, some of us used different techniques to pull the tires around the playground. 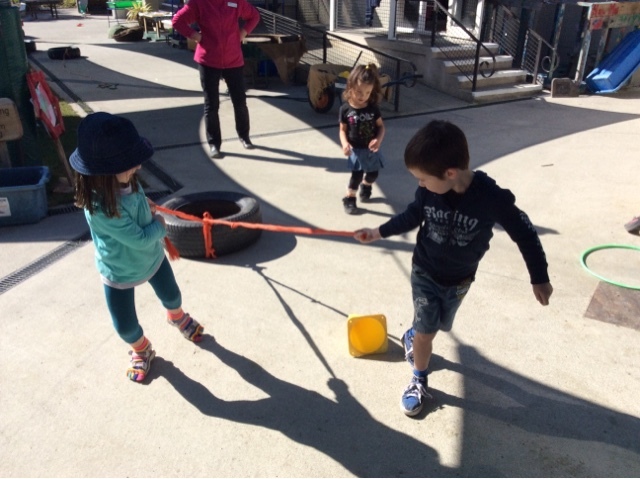 Mahi tahi/ working together was one strategy to get the tire to move while others used a shorter rope. 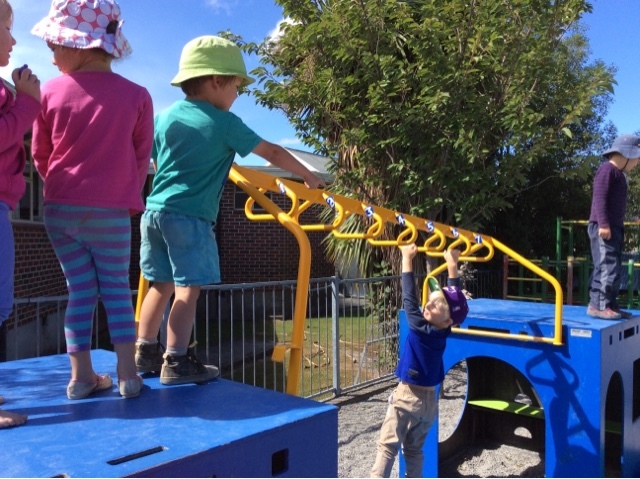 From here some of the children persevered with difficulty as they tried to use their arm muscles to get across the monkey bars, something some children have been trying to achieve for a long period of time and others taking a risk to try something new. Soft foam shapes were put under the monkey bars to help some children take a responsible risk to give it a go swinging on the monkey bars. When things are difficult don’t give up, ka pakeke te haere kaua e hemo. 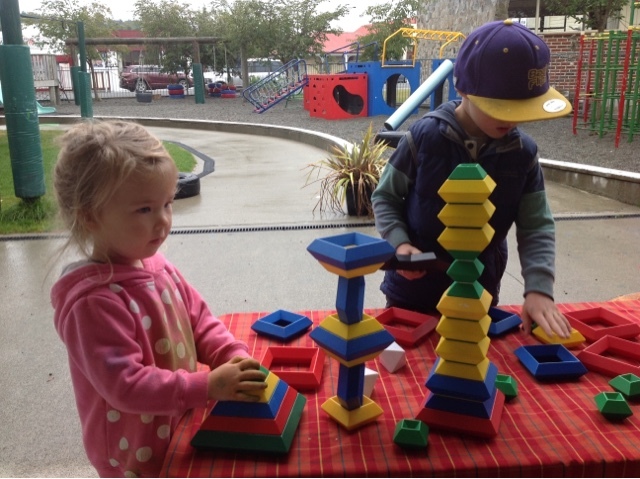 Mahi tahi, working together in play. 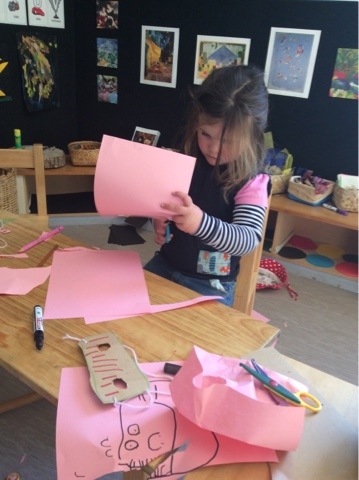 This week at kindergarten we have had wet cold days, so we have noticed a lot more children inside, constructing great masterpieces in different areas. 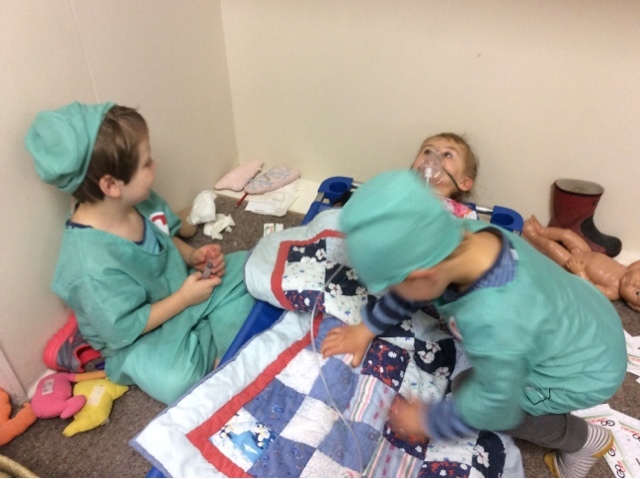 As we have worked alongside them we have noticed a lot of children working together to achieve a common goal. 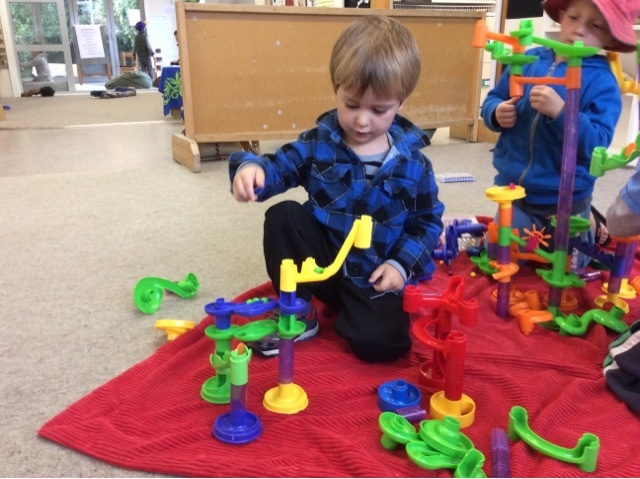 They all spent time persevering with difficulty as they worked out how their friends could join in their play or until their towers were really tall and they had achieved the goal they set themselves. We work together for maximum impact, Ka mahi ngātahi mo te tukinga nui tonu. 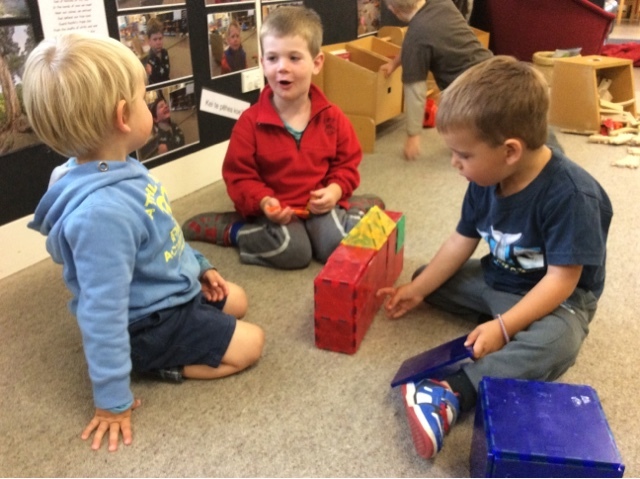 Manaakitanga/ care and respect was evident in all the different activities as children made sure their friends were included and they listened as each other clearly articulated their ideas. 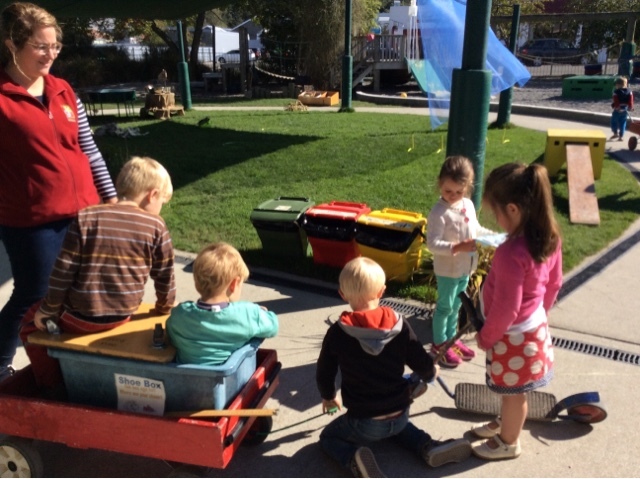 Finding humour has been evident in all areas as the children laugh and play together. What a great week we have had so far. 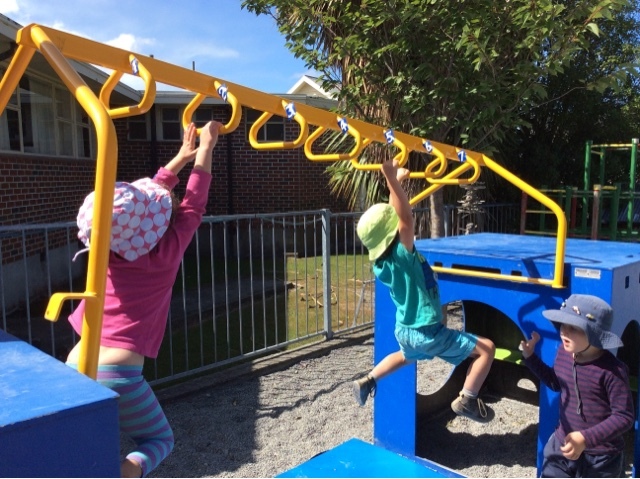 This week a group of children set themselves a task to swing across the monkey bars unaided. 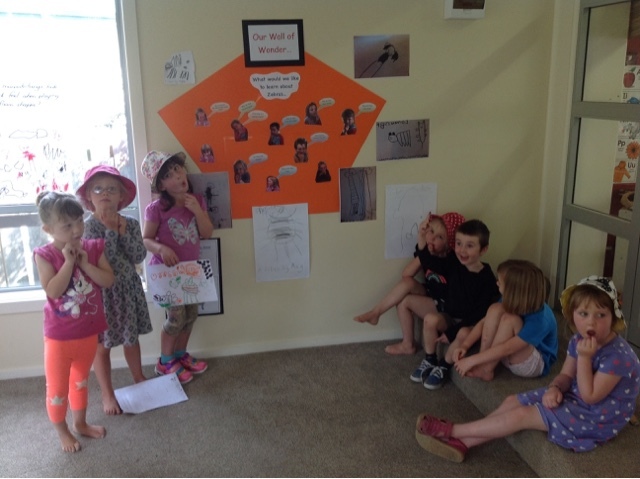 The tamariki were encouraging each other to climb further and further to try and make it to the otherside. 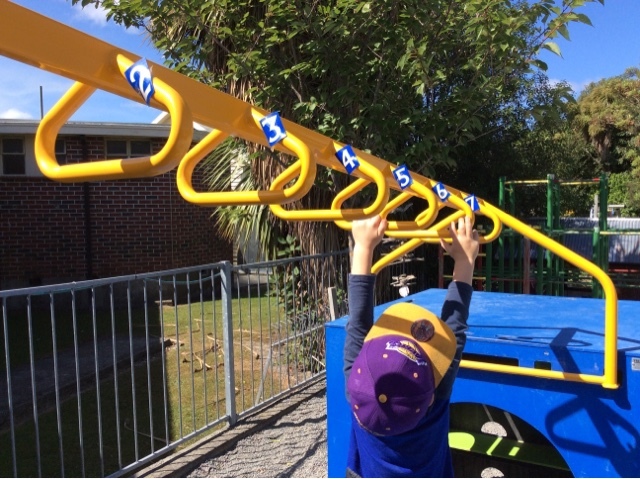 Today we added some numbers to the bars so the tamariki could clearly see how far they were climbing and then try to reach a higher number. 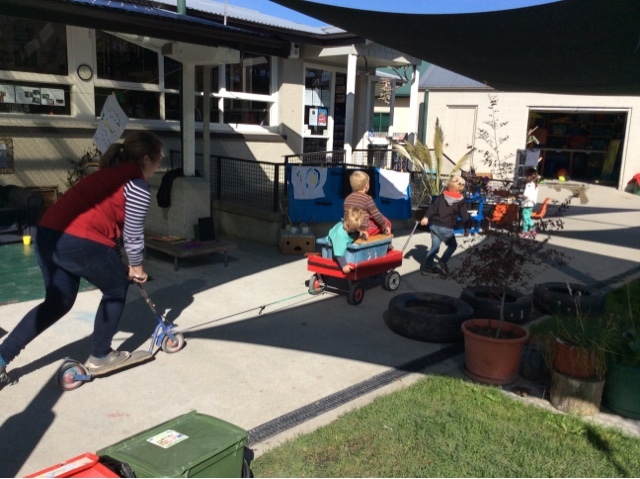 This allowed the tamariki to set goals for themselves and introduce numeracy in a meaningful way. 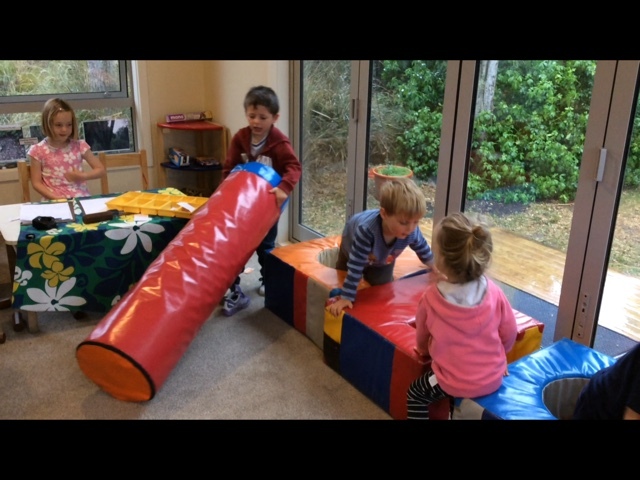 Lots of persevering happened, a wonderful habit of mind to develop, as the children kept climbing up for more and more turns, trying hard to beat their last number. Practice and determination are the key to improving skills and this was certainly evident today. We back ourselves and others to win. Ka manawanui ki a mātou me ētahi ake kia wikitoria. When we set up each morning we often look at the weather - it was rather cold and damp outside - and we think about what activities that would create interest and inspire the children when they enter the building. Today the bright coloured marble run attracted James and Jack to build their creations that made us really curious. 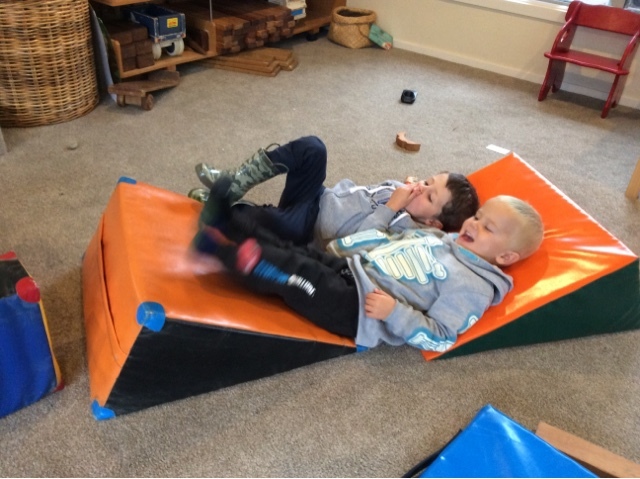 Gina, our student who is with us for 5 weeks, shared that she found James had an amazing ability to persevere; when it didn't fit or fell down he would try another way. 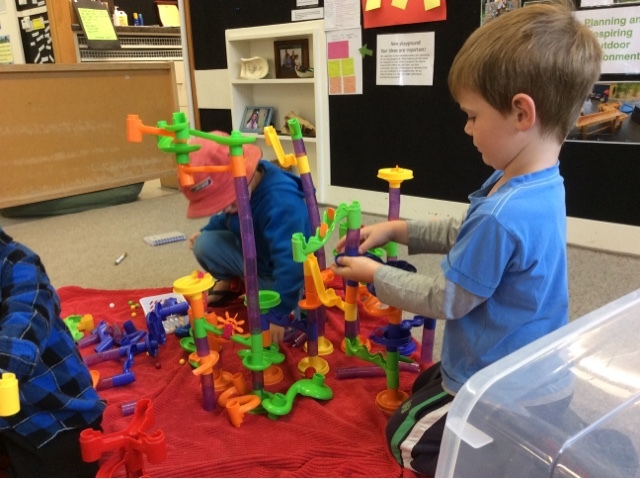 Jack, who is younger, worked beside James and we reflected the wonderful dispositional learning taking place between the two tama of working interdependently in a steady, calm manner with the goal to explore the marbles coming down in a range of ways. 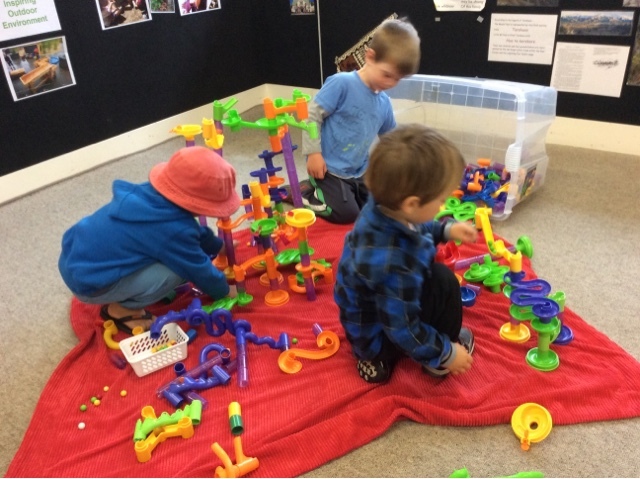 We are problem solvers, ngā tamariki kaipororaru whakatika. We explore and find out things by doing and having a go! 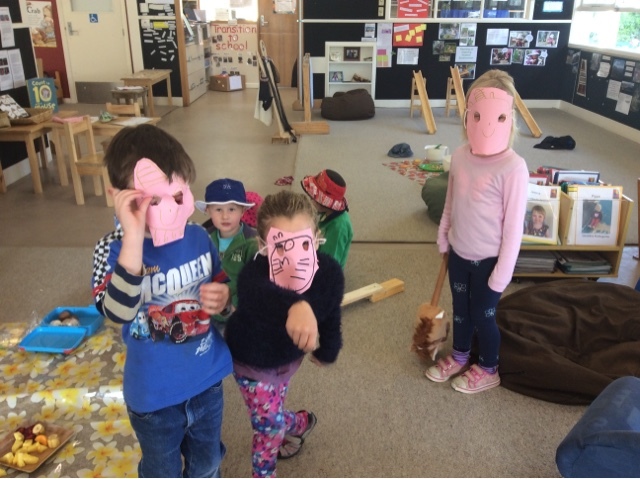 This morning a small group of children were gathered around the art table and very quickly shared their intentions with Sandra - to make masks. So as some conversations around how everyone's masks were going to look look place, there was a hive of activity. Children around the art table choosing the right colour and sized piece of paper before drawing their mask design of choice on. For some, this took time and practise, getting exactly the right design that they had it mind - striving for accuracy was clearly important at this point! And then it was time to cut out their masks, it took some time to cut around the outside of the mask design and for some a harder task than for others. Ka pakeke te haere kaua e hemo - When things get difficult don’t give up. Perseverance was definately Habit of Mind that was practised today, as everyone stuck to the task of finishing their mask. Jordan was soon recognised as the expert in cutting out eye holes on his mask and also supported others with this necessary task! As the string was tied the masks could not be put on fast enough and the play began in character of corse!